U.S. citizens returning home from Canada, Mexico, the Caribbean or Bermuda, by land or sea, will be required to present one of the travel documents listed below. Special Groups – Information for Children, Groups of Children, Native Americans, "Closed Loop" Cruises, U.S. Lawful Permanent Residents, Ferries and Small Boats, and Boaters..
Form I-872 American Indian Card, or (when available) enhanced tribal cards; Update The Department of Homeland Security and the Seneca Nation of Indians today formalized an agreement to develop a Western Hemisphere Travel Initiative (WHTI)-compliant Enhanced Tribal Card (ETC)—signed by U.S. Customs and Border Protection. The ETC establishes identity, tribal membership and citizenship for the purpose of entering the United States by land or sea—enhancing safety and security of U.S. borders while facilitating legitimate travel and trade. 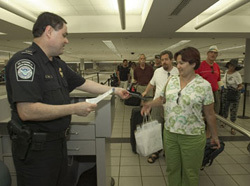 DHS implemented WHTI at land and sea ports of entry on June 1, requiring travelers to present an approved travel document to enter the United States. Approved documents include passports, U.S. passport cards, trusted traveler program cards and state- or province-issued enhanced driver’s licenses. ETCs, developed in accordance with the signed agreement, will also be accepted for border crossings. The Seneca Nation, one of the six nations of the Iroquois Confederacy, occupies aboriginal lands in western New York, including sovereign territories in Niagara Falls and Buffalo. U.S. Merchant Mariner Documents (for U.S. citizens, when conducting official business). Both today and after June 1, lawful permanent residents if the United States should present acceptable evidence of their lawful residence status when entering the country, such as a permanent Resident Card ( I 551 ). A passport for truckers is not required. NEXUS is a joint CBP-Canada Border Services Agency program that both governments implemented to enhance border security while simplifying the entry process for pre-approved, low risk travelers. It was established in 2002 and more than 260,000 members participate in the program. SENTRI is a land-border crossing program that provides expedited CBP processing for pre-approved, low risk travelers along the U.S./Mexico border, and has grown to include 16 lanes at the nine largest ports of entry. More than 185,000 travelers from both sides of the border currently are registered in the SENTRI program. It is anticipated that ID cards issued to truckers under the Free and Secure Trade (FAST) program will be accepted in lieu of passport for truckers. Officials at the State Department and Homeland Security are working out details of procedures following passage of the new security rules, but credentials under the FAST and NEXUS program for travelers "will be acceptable." The Free and secure Trade Program is available to commercial drivers crossing both the northern and southern borders. Currently, the program has more than 94,000 members. The Western Hemisphere Travel Initiative the joint DHS- Department of State plan that implements a 9/11 Commission recommendation and Congressional mandate to establish documents requirements for travelers entering the U.S., Canada and Bermuda. WHTI document requirements for air travelers went into effect 2007.